Now this is my kind of cookie! 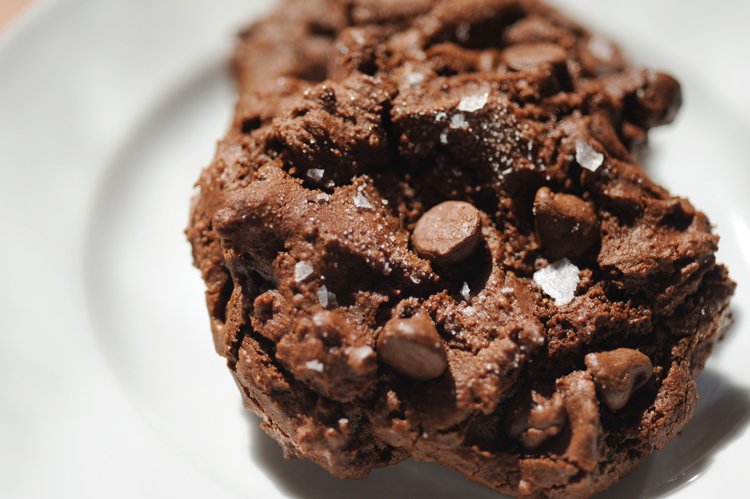 Chocolate, cocoa, ginger, cayenne, a touch of cinnamon and sugar, a dash of mischievousness topped with flakey salt. This is definitely not a batch you plow through mindlessly while watching your favorite program and suddenly realize you’ve eaten your weight in an innocent looking snack. These cookies have serious character. They’re not too sweet, they definitely have some heat and a lovely crunchy outside with a fudgey like center. These little beauties demand respect! 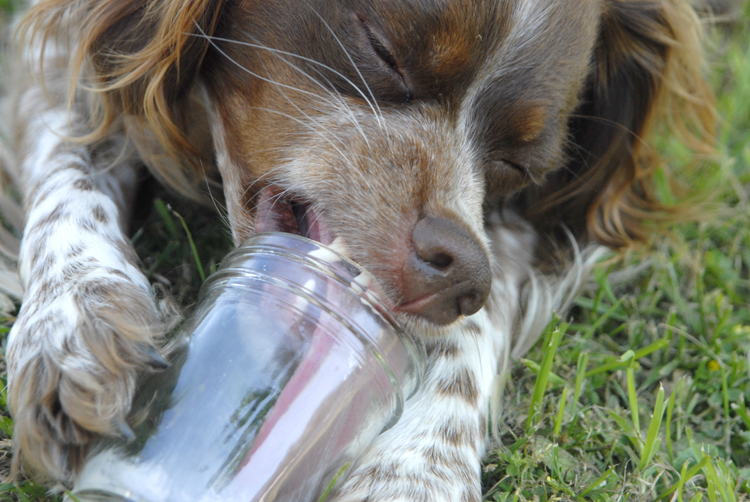 Be sure to have your favorite chilly beverage accompaniment at the ready – you’ll need it. 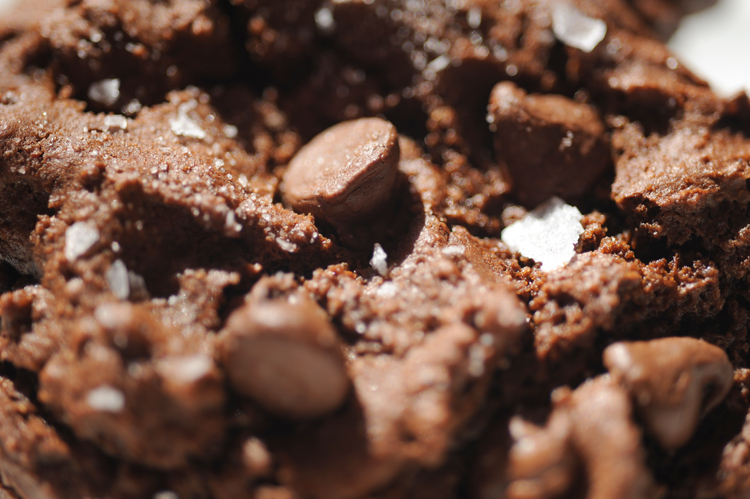 Sift all the dry ingredients into a large bowl and add the chocolate chips mixing until well incorporated. In another bowl whisk all the wet ingredients until very well combined. Add the wet ingredients into the dry ingredient bowl and mix thoroughly. Spray a cookie sheet with non-stick spray. Press balls of dough mixture onto the cookie sheet until each is about ½ inch thick. I used walnut sized pieces and flattened them, but the original recipe uses fist size balls. Sprinkle with white sugar and rock salt or a finishing salt – I used Maldon’s. Bake for approximately 11 minutes or until the cookies just begin to crack at the edges or feel slightly firm on the outside (it’s unlikely that a toothpick would pull cleanly from these as they have a soft center). Cool on a rack for a few minutes if you can manage the restraint. Worth every bloomin’ calorie! Lemon Posset (aka pudding) is refreshingly clean, yet slightly rich dessert perfect for warmer days. The scented geranium is optional but it does add that lovely mysterious flavor that no one can put their finger on. Most larger nurseries carry scented culinary geraniums. (And many of you will know by now, if I’m posting using a geranium in the dish, it was a recipe from Ballymaloe Cooking School). Place the cream, sugar and geranium leaves in a saucepan and bring to a gentle simmer. Turn down the heat to low and cook for five minutes, stirring often. Remove from heat and discard geranium leaves. Add lemon juice, stirring to fully incorporate. Pour into 4 small dessert bowls and place in the refrigerator for at least 1 hour. We served these during our friends Teri and Jay’s visit from Orcas Island. Orcas Island is a stone’s throw from Lopez yet unless you have your own boat getting back and forth on the Ferry takes some time. Fortunately the ferries that service our islands are a relaxing and social way to commute! Spring has finally sprung!! What does that mean on Pole’ Pole’ Farm? It means lots of mowing, planting, growing, weed whacking, more mowing, building and baking! 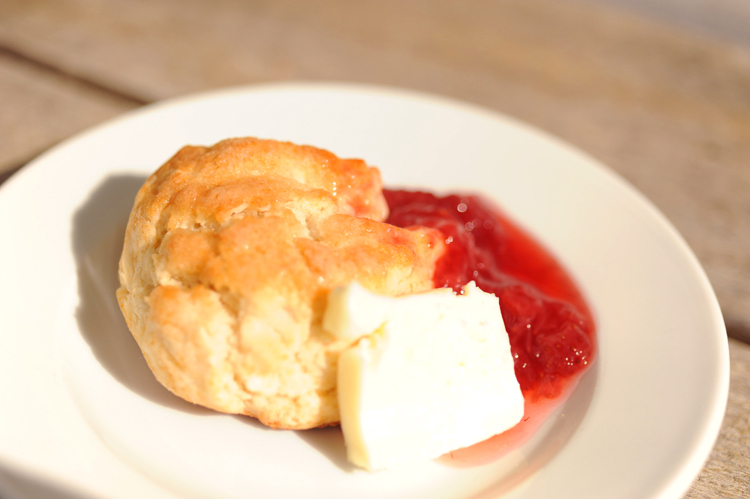 This quick scone recipe is just as tasty as the one we learn to make at Ballymaloe Cooking School during the 3 month course, but it is less involved and for those who use imperial, a bit easier to throw together. Preheat oven (I use my toaster oven for this) to 425F. Put the flour, baking powder, sugar and salt in a large bowl and whisk until well incorporated. Cut the butter into pea size pieces. Rub the butter into the flour making a very coarse mixture. Pour in the cold milk and mix with your hand until a soft dough forms. Turn the dough out onto a lightly floured surface. With clean and floured hands, gently pat the dough down to about a 1 inch thick circle. Using a floured, 3 inch biscuit cutter cut out as many biscuits as possible, reshaping the dough gently if necessary. Spray a baking tray with non-stick coating (one that can take high heat such as grape seed etc). Place a 1/4 of additional sugar on a small plate. Whisk the egg and pour into another small plate. Dip each scone top into the egg wash and then into the sugar and place on the baking sheet allowing space between each scone. Bake until golden brown on top, about 15-18 minutes. Serve with butter, jam and freshly whipped cream. This quick elegant dessert hits so many flavor points. It’s hot, tart, citrusy, creamy, and slightly sweet. Delicious! Sift the flour and salt into a large bowl. Make a well in the center and crack the egg into the well. Gradually add the milk and whisk into a smooth batter. Heat a 9″ non-stick pan over medium heat. Add a little peanut oil to the pan and carefully wipe most of it out with a paper towel (repeat this step before adding each addition of batter if necessary). Pour approximately 2 ounces of batter (¼ cup) to the pan and swirl to coat as evenly as possible. Cook for about 1 minute – the batter will begin to show signs of cooking. Go ahead, loosen the sides and take a peek! If the underside is browning slightly, it’s time to turn. So far my method for this is to loosen the edges, grab the crêpe (and the side of the hot pan), cuss, wrangle the crêpe with the spatula and eventually get it to the other side. Cook for about a minute more, looking for golden brown patches. Rustic yet elegant, no? Oui. Place each cooked crêpe on a plate and set aside. There should be 4 unless you’ve dropped one or stuck it to the ceiling with a mighty flip attempt. Pour orange juice, honey and butter to the pan. Simmer for about 5 minutes or until slightly thickened, letting the flavors amalgamate. Remove from heat and add the whiskey. Place the pan back on the heat and reduce the temperature to low. Fold each crêpe in half and then in half again making a triangle. Place each wedge in the pan with the point meeting in the center (so they all fit and show off your geometric prowess). Let them simmer in the sauce about 1 minute and then carefully turn them. Plate the crêpes using a spatula. 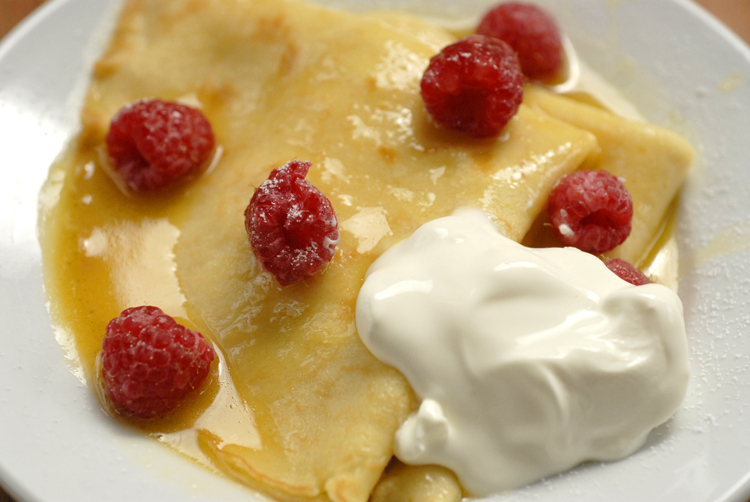 Pour some juices over the top and add raspberries, sugar and creme fraiche. I have to say overall I don’t travel well…or smart. I’m definitely not one of those people that seem to stay mysteriously fresh looking throughout their travel experience. I really envy those who dress smart and look perky and seem to know where their gate is via some internal GPS system. 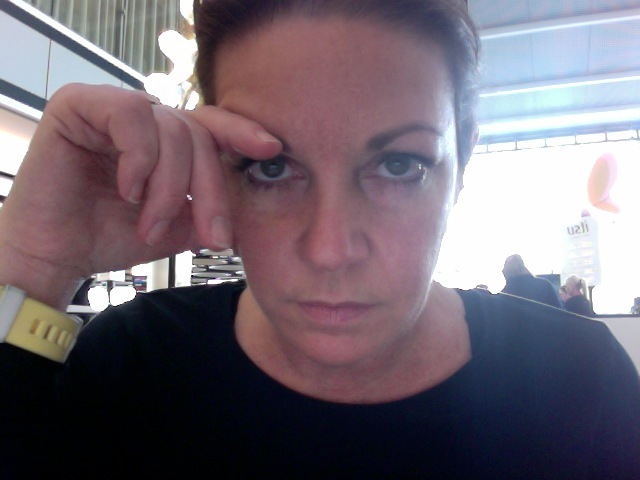 I, on there hand, look like a train wreck, feel half dead, normally lost, drink way too much caffeine followed by beer, wine, champagne, followed by way more caffeine while I manage to food crawl through hours of layover. I need to learn how to spend down time more productively no doubt. On the brighter side, the 12 weeks at Ballymaloe Cooking School has ended and some students have found employment! Well done for them. Others have accumulated some valuable culinary knowledge that they will impart in one form or another throughout their lives. I’m looking forward to seeing how much information from this experience will stay in my noodle and for how long. The most enjoyable part of my time abroad was meeting so many fantastic people and working with them (and playing with them) in a very unique and intense environment. I’ve made some new friends and that in itself was worth the journey. Please stay in touch and look for posts from the green isle and other places in the near future. Cheers! This is a great recipe, especially for us beginner bakers here; regardless of the outcome: slightly under-baked, slightly over-baked or burnt to a crisp we manage to slather them with butter and homemade jams and gobble them up. Sieve all the dry ingredients (except sugar for glaze) in a large, wide bowl. Cut the butter into cubes and rub the butter into the flour. Make a well in the center of the butter/flour mix. Whisk the eggs (except the egg for glaze) with the milk and it to the dry ingredients. Stir until a soft dough is formed. Turn out onto a floured surface and make a round using your hands. Roll out gently making a 1 to 1 1/2 inch ‘pancake’ and cut into rounds using the 3 inch cutter. Dip the tops of each scone into the egg wash and then into the granulated sugar. Place on a baking sheet and bake for 10-12 minutes. Cool on a wire rack. Serve split in half with jams, butter and or whipped cream. whisk 1 egg with a pinch of salt. 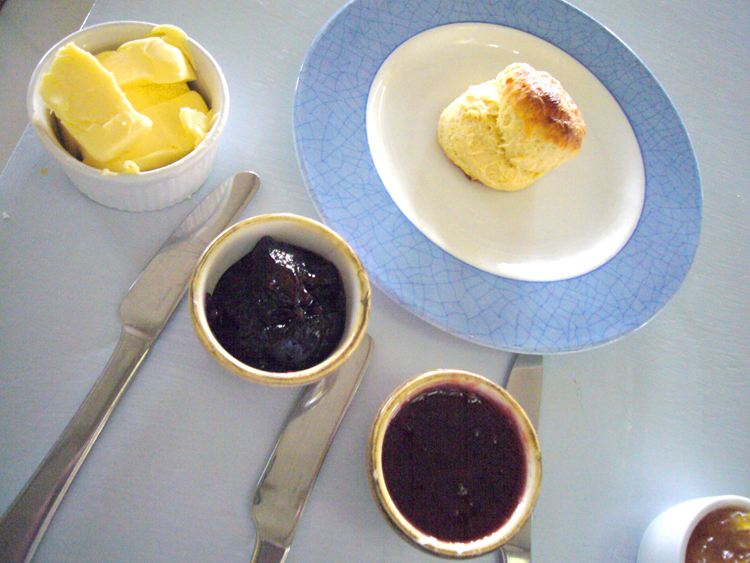 Brush or dip the top of each scone.